When I hear lamb chops, the idea of a fancy rack of lamb comes to mind. Perfectly grilled over grapevines in a fire pit in Spain or in my favorite restaurant, rack of lamb is definitely one of my go-to favorites. Rarely, if ever, do we find rack of lamb that’s affordable, but that doesn’t mean we never eat it. 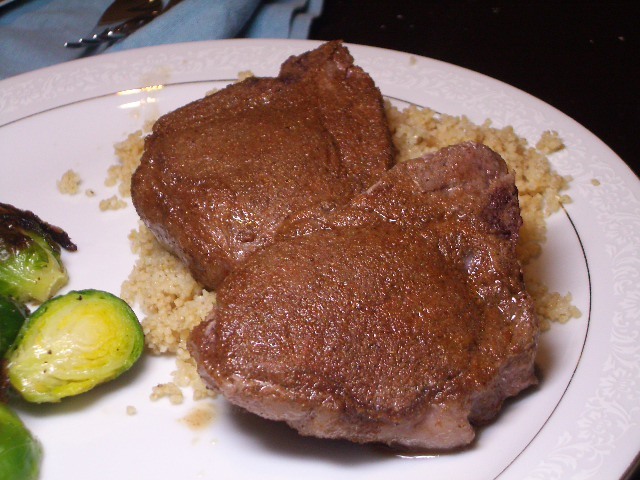 Strolling through the grocery store recently, we came across some lamb loin chops that were on sale. A source tells us that these chops are basically the lamb version of a porterhouse steak, which makes sense based on the meat and the bone structure. So, even though these weren’t the highly sought after rack of lamb, you can imagine how delicious they were. On top of changing it up from rack of lamb to the loin chops, we decided on a completely new take on lamb. We’ve been wanting to try African, Middle Eastern and Indian cooking recently, and we decided on a Moroccan spice recipe as a rub for the chops. It was really delicious, and the cous cous underneath was perfect for sopping up the juices. how ironic that i just made rack of lamb last night for valentine’s day dinner! it was my first time, and it was absolutely delicious. i think i am now a lamb fan… so thanks for the idea on lamb chops!